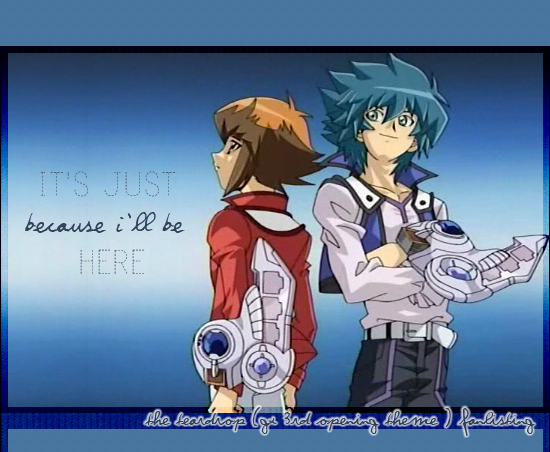 You've just reached "It's just because I'll be here ", the TAFL-approved fanlisting for Teardrop, the 3rd opening theme of the serie Yugi-oh! GX, performed by BOWL! "Yu-gi-Oh!" is an original creation of Kazuki Takahashi. "Yu-gi-oh! GX" is an anime by Studio Gallop, manga by Kageyama Naoyuki, published by Shueisha, all rights reserved. "Teardrop" has been created by Maruyama Kazuhiro and performed by BOWL, all rights reserved. This is only a fansite and the webmistress doesn't inted to violate those rights. Layout and contents are (c)Akira K.S. Do not reproduce without permission. Online since November 20th, 2008.